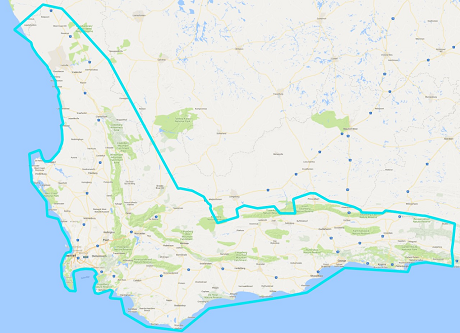 Drought-stricken Cape farmers are receiving help from above – through satellite data they are able to monitor their water use efficiency, with reported improvements of at least 10%. The Western Cape Department of Agriculture is providing the FruitLook service, brainchild of Dutch company eLEAF, without charge to fruit farmers. From this season, thanks to increased government funding, FruitLook covers all of the irrigation areas in the Western Cape, as well as the Eastern Cape section of the Langkloof. This means it is available to all of the fruit-producing areas of the Western Cape, running up the West Coast to the north of Vredendal. Even hops farmers in the George district and dairy farmers in the Tsitsikamma are now using it. 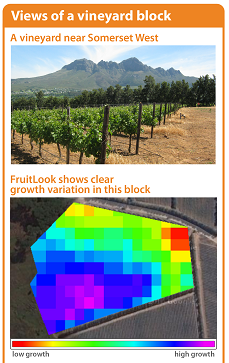 FruitLook was introduced in 2011 by the far-sighted André Roux, former Director Sustainable Resource Management at the provincial Department of Agriculture. He retired last year but was brought back by the Western Cape Premier’s office to coordinate and monitor the province’s drought activities. 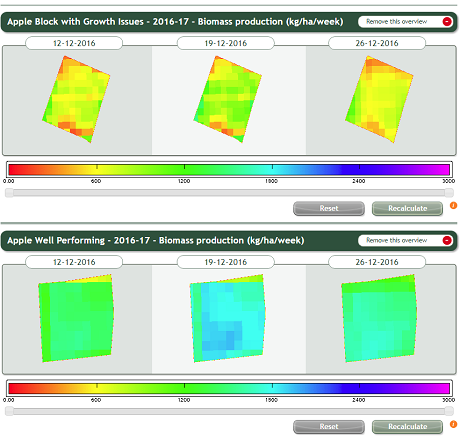 During the period of August to April fruit growers log into the FruitLook website to compare blocks on their farms in terms of actual biomass production (supported by the vegetation and the leaf area index displaying crop health and density), evapotranspiration and the deficit thereof as well as the biomass produced per m3 of water consumed by the crop. Cumulative biomass, measured in kg/ha, is an indicator of production. FruitLook allows a producer to determine how much water was needed for a specified amount of growth as well as whether too much water was perhaps used to bring forth a certain amount of growth. 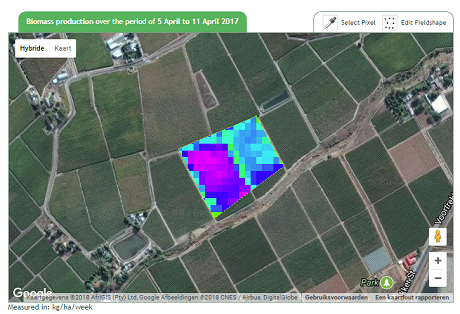 The overview of the orchards aids growers to start recognising trends regarding over- or under-irrigation, to understand growth variation across the farm and it allows a grower to compare blocks over time. By now six years of data is available, rendering the tool increasingly useful as time goes by.